Cary Joji Fukunaga is directing the new James Bond movie. Here are 3 things to know about him. Ending weeks of speculation following the abrupt departure of director Danny Boyle from the as-yet-untitled 25th James Bond movie, American director Cary Joji Fukunaga has been announced as his replacement. Fukunaga is slated to begin filming the project — expected to be the final film starring Daniel Craig as 007 — next March, and the film is eyeing a February 2020 release date. Boyle, who directed Slumdog Millionaire and 28 Days Later, among other movies, dropped out of the project in August due to “creative differences,” provoking curiosity and speculation over who might take the reins in his absence. And while the choice of Fukunaga as Bond director is somewhat unexpected given the franchise’s history, it’s also exciting for those familiar with him and his work. Here are three things to know about the newest Bond director. Technically, an American has helmed a Bond film before — the Philadelphia-born Irvin Kershner directed the 1983 Sean Connery Bond film Never Say Never Again — but that was a bit of an outlier, one of the few Bond movies not produced by Eon Productions. The James Bond movies are so steeped in Britishness that the character has only once been portrayed by an American (Barry Nelson, in a 1950s television version of Casino Royale). But Fukunaga has long made films that span cultures and languages, and his unusual visual sense and taste for grittier work likely make him a great candidate for the job, regardless of nationality. Fukunaga’s first feature, the 2009 indie movie Sin Nombre, is a Mexican-American film set near the border about a young boy who’s a member of the MS-13 gang and a girl trying to cross into the US. It was filmed entirely in Spanish and premiered at Sundance, where it won awards for directing and cinematography. He followed it up with the 2011 film Jane Eyre (starring Mia Wasikowska, Michael Fassbender, and Jamie Bell) and 2015’s Beasts of No Nation, which was one of the first films to be released on Netflix and in theaters on the same day. 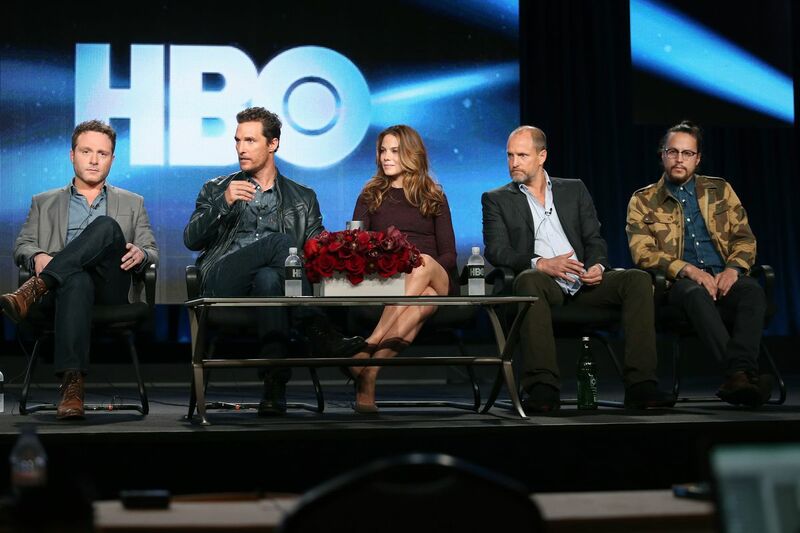 True Detective season one producer and writer Nic Pizzolatto, stars Matthew McConaughey, Michelle Monaghan, and Woody Harrelson, and Fukunaga speaking at the Television Critics Association tour in 2014. But though his movies have garnered accolades from critics, Fukunaga is known just as much for his TV work. He directed all eight episodes of the first season of True Detective, starring Woody Harrelson and Matthew McConaughey, which netted him an Emmy in 2014. The series was highly lauded by critics and audiences, with an especially memorable single tracking shot sequence in the fourth episode. Fukunaga has served as executive producer on other films and TV shows, such as this year’s TNT limited series The Alienist. And his latest TV project, Maniac, starring Jonah Hill and Emma Stone, is set to release on Netflix Friday, one day after the Bond announcement. Fukunaga has spent much of his life moving between cultures and absorbing them. His father, a third-generation Japanese American, was born in an internment camp in the US during World War II; his mother is Swedish-American. His parents split when he was a child, after which his father married an Argentinian woman and his mother married a Mexican-American man. Fukunaga is fluent in French as well as Spanish, the latter of which he learned during summers in Mexico with his mother and stepfather. Fukunaga grew up in the Bay Area and once wanted to be a pro snowboarder, something he actively trained for, eventually living in Japan for a year. He majored in history at UC Santa Cruz and studied political science at the Institut d’études politiques in Grenoble, France. But eventually, he figured out that he wanted to be a filmmaker — his first job in the field was as a camera production assistant on Destiny’s Child’s “Survivor” video — and attended New York University’s Tisch School of the Arts’ graduate program in filmmaking. While a student, he wrote and directed the 2004 short Victoria Para Chino, which screened at Sundance and won a Student Academy Award in 2005. After his win for True Detective, Fukunaga became something of a sensation on the internet, as much for his braids as for the various endearing bits of trivia that surfaced, such as the fact that he likes to send Cary Grant GIFs to his friends, writes long love letters, and dated Michelle Williams for a while. And now that he’s helming a Bond film, his popularity seems unlikely to wane anytime soon. Next articleDC voters raised the minimum wage for restaurant servers. City lawmakers are ready to cancel it.